On paper this looks like it could be a very dry and academic exercise in music making, and if there is a faint whiff of academia on the opening 'Lugano' (along with the influence of early 20th century Parisian modernism) this is quickly dispelled as piano and saxophone weave their intricate lines in and out of the melodies created by the duo. This is heard in the superbly on the title track, 'Temporary Kings', which exudes an air of regal authority with no indication of pomp or ceremony, just a quietly spun lyricism from both participants. It is this control and restraint that makes this album so rewarding and such a joy to listen to. Throughout the set Iverson's piano is totally in tune with the material and the saxophonist, so much so that the listener can delight in the unexpected twists and turns in the music. 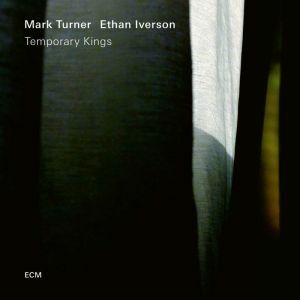 With so much shared history between the two musicians that stretches back to the 1990's, and their time spent working together in the Billy Hart Quartet with which they have recorded two albums for ECM, Turner and Iverson now have an almost telepathic rapport. This can be heard in the way in which the pianist always seems to have exactly the right phrase or vpicing when accompanying the saxophone line. Mark Turner is now firmly established as one of the most original voices on his instrument, and his mastery of the tenor saxophone is quite staggering. He has an effortless ability to move through the registers with a sonic consistency that ensures each note is perfectly weighted and balanced, with a sound of crystalline beauty and each phrase delicately carved out the song being played. He has worked patiently at his music over the years to the point that he has assimilated the past history of the tenor, and then stripped his playing right back eschewing any excess or superfluous gestures and built his playing to be free of cliche, all delivered with a unique tone and concept. If Turner's playing style is now almost wholly his own, he does acknowledge his debt and respect to mentor, Warne Marsh, on a superb 'Dixie's Dilemma' which itself is a contrafact on 'All The Things You Are' with the his playing having an assured swagger that is in nice contrast to the more reflective sounds elsewhere. It is this lack of excess baggage and considered approach to the compositions that capture the attention time and time again. Iverson's tune, 'Unclaimed Freight' could easily become a cumbersome vehicle, but firstly piano and then tenor can be heard working at the underlying structure to make this ungainly beast strut with confidence. As duo go, this partnership is pretty special. Taking a chance with a set of original compositions (all except 'Dixie's Dilemma' are penned by Iverson or Turner) the two musicians bring this music to life with their combined experiences and compatibility to produce music that has depth and passion in equal measures.